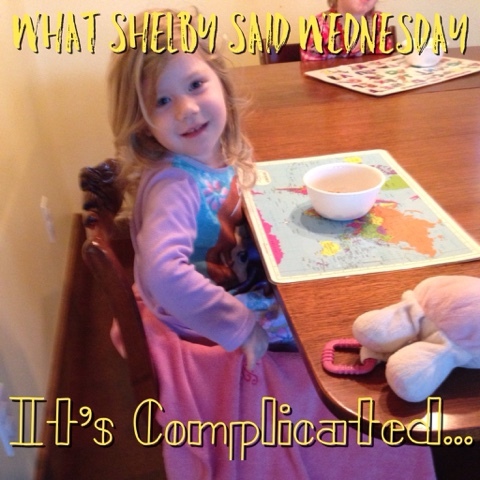 I'm frequently surprised by things Shelby says. She uses fairly deep concepts in the right context, or words that I'm not sure how she knows ... yet here she is, using them properly and seeming to grasp their meaning. "My blanket isn't simple to put here!" She has for some time been a bit like Linus with her "pink blanket." It is a mauve blanket that says "Princess." At some point early on she latched onto it and hasn't wanted to let go. Until this past week. Tim went to put it on her at bed time, as usual for the past couple of ... well, years really, and she said no. She didn't even want to touching her. She allowed us to put it next to her. I thought for sure she'd wake up during the night wanting it, but I never heard a peep.